My third day in Colorado was spent tasting a multitude of spirits -- and enjoying more of the state's farm fresh food. I was picked up in the morning by JoAnne Carrelli-Stevenson, who is in charge of the Colorado Distillers Guild. 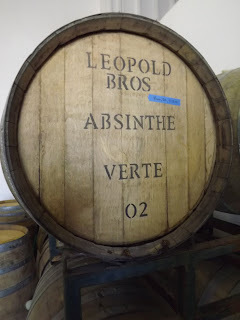 We had a nice talk on our ride through Denver to Leopold Brothers about the growing distilling industry in Colorado, a state which now has 250 beverage producers. She also filled me in on the Great American Beer Festival, which happened to be starting the next day in Denver. I was thinking that I may just have to stop by there, but first it was spirits time. The tour at Leopold Brothers had already started as there was a group of distributors from Kansas I was joining. Todd Leopold took us through the fermentation and distillation process, and into both the bottling and barreling rooms. This company is one of the few that distribute their products out of state and it’s quite a complex production center as they make a huge variety of products. We went into the conference room for some serious tasting (I don’t think I’ve ever seen so many bottles come out at once). Unfortunately, I was on a tight schedule, but I did get to try a few of Leopold Brothers products: the Maraschino Liqueur was delicious and brandy like; I was not a big fan of their vodka, made from a combo of potatoes and grain and not very noticeable on the nose or the palate; I really liked their Absinthe and Peach Whiskey, which was sweet and fruit-filled; the one that really impressed me the most was the Three Pins. This herbal liqueur is full of cinnamon and cloves, making it more spicy than sweet. 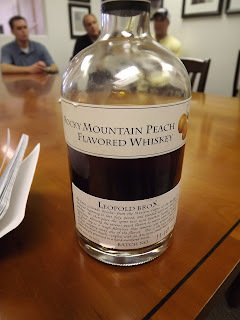 As much as I liked the Leopold Peach Whiskey, I had been blown away by the cocktails made with Peach Street Distillers Peach Brandy and was excited to be having lunch with one of the owners, Chris “Moose” Koons, whom I had met at the Colorado Harvest event in New York City. 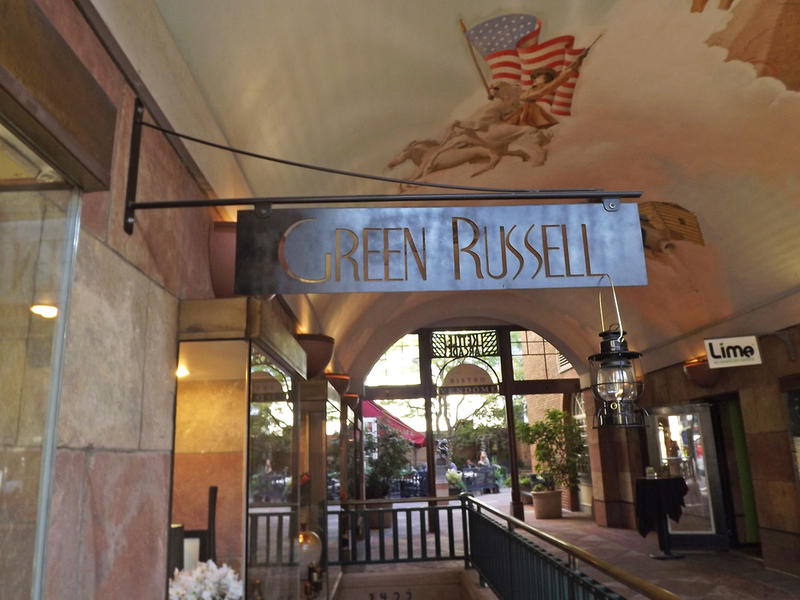 We had a fun time talking spirits during lunch at Steubens Restaurant. Steubens looks like a diner and serves comfort food at its very best (and I enjoyed every last bite). 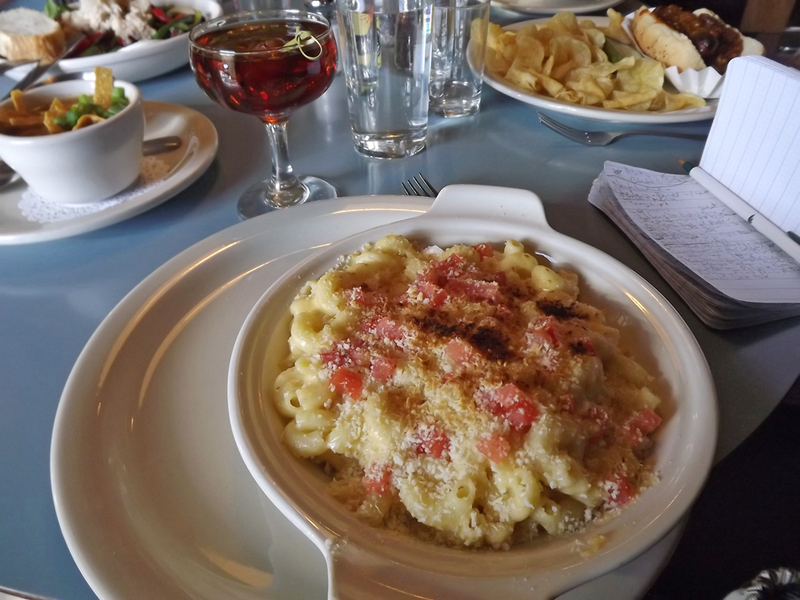 The Macaroni & Cheese with tomato (you can order it with an assortment of other add-ins) was a perfect lunch portion of heaven. Moose did his part on comfort food tasting with a Chili Dog. 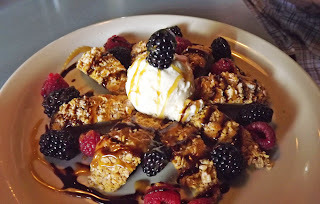 We then talked some more about spirits while nibbling on Matty’s Wacky Apple Dessert, basically a cut-up caramel apple topped with ice cream, berries and more caramel. I don’t think I even have to tell you how good that was! 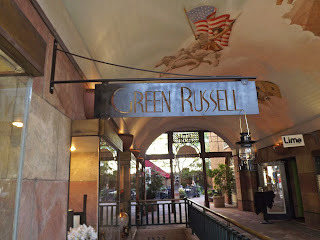 Elysia from Colorado Tourism picked me up for the evening and our first stop was at Green Russell, named after a Colorado gold miner who struck it big at this location in Denver, now known as Larimer Square. This place is definitely taking the speak easy concept to a whole new level. Though the renovation isn’t complete, they will actually continue to sell pie, the key to getting yourself inside this beautiful bar. 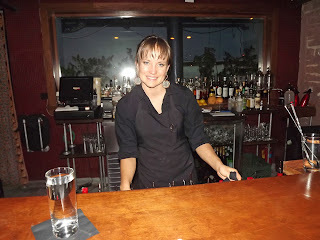 Alex was our bartender and she was very hospitable. The philosophy here is to keep the customer happy with drinks they enjoy more than worrying about what’s on the current menu, all twists on classic cocktails. She made me The Patrician, St. Germain, with Cava and Crème Violette. It was delicious, with a little bit of sweetness and lots of floral. Elysia had A French 75, with Cognac and Champagne. All drinks include fresh herbs, which are actually grown in a greenhouse on the premises (you can see some of it when you are sitting at the bar. I’m not quite sure which was more unique about Euclid Hall, the décor or the menu. Both were ultra-modern. Andy of Downslope Distillery met us there and before we ate we got to sample some of what he has to offer. His specialty at the moment is a Wine Barrel Aged Rum, which I thought was very whiskey like. I had some of the Downslope Cane Vodka, which is gluten-free, and really liked the Grain Vodka, a smooth blend of barley and rye, and the Pepper Vodka, the perfect addition to a bloody Mary. 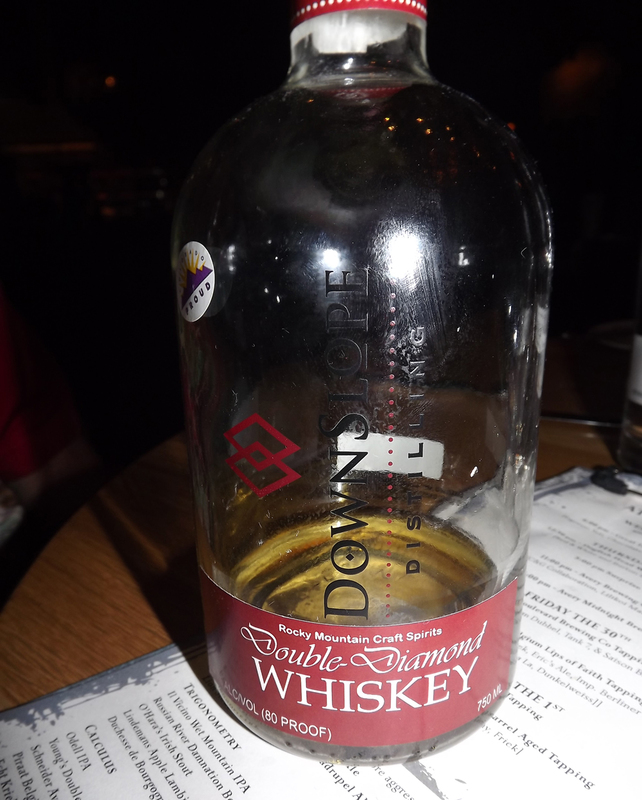 The Double Diamond Whiskey was good, with a sweet smell and a dry, spice-filled finished. Unfortunately, I didn’t get a chance to try more of his products, but I have my eye on the Vanilla Rum, made in small batches to hold the flavor. We had a delicious dinner at Euclid Hall, starting with Cheese Curds and French Fries for an appetizer. For a main course Elysia and I both had the Camembert and Peach Puree Sandwich, served with Grapes in basil. The menu called it “Grown Up Grilled Cheese,” but I’ll just call it spectacular. I bid farewell to Elysia for the last time as my final day in Colorado was without her. It was scheduled as a “free day” for me to explore, but I had a feeling it was going to fill up very quickly. I really liked their Absinthe and Peach Whiskey, which was sweet and fruit-filled; the one that really impressed me the most was the Three Pins. It taste well together with those delicious foods.